While an equal assortment of both good and evil Disney characters are found in the Heroes vs. Villains release, the 2016 Funko Disney Villains Mystery Minis shine the spotlight mainly on Disney’s prominent wicked characters. Weaving the connection further, the classic tricksters are paired with select companions from their respective films, some who are not actually evil themselves. And, there is a villain for everyone, with figures representing at least one Disney movie from each of the past six decades. Figures and companions include duos such as Hades and Pain from Hercules, Cruella de Vil and Patch from 101 Dalmatians, and the Red Queen with White Rabbit from Alice in Wonderland. 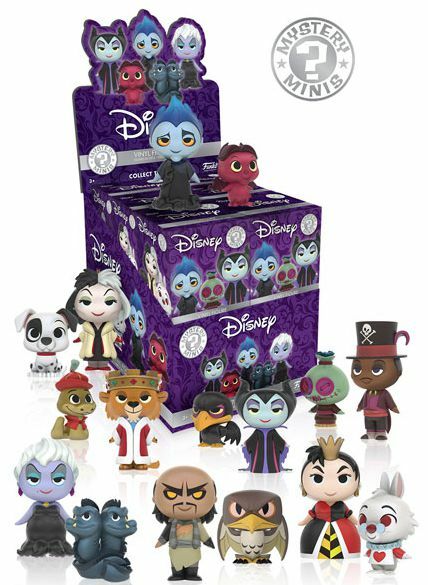 Adding to the excitement, the figure's identity remains hidden as 2016 Funko Disney Villains Mystery Minis are issued in a blind-box format. In other words, every box looks and feels the same to keep the element of surprise. With 12 boxes per case, collectors will need more than one to attempt a complete set. Potentially increasing the difficulty, the main 16-figure set could grow even larger depending on exclusives. However, nothing else is known at this point. The specific odds are not currently available for the 2016 Funko Disney Villains Mystery Minis but will be updated as details emerge. Each figure is approximately 2 1/2" tall but the companions are noticeably smaller. Funko Mystery Minis Disney Villains Lot Of 9 W (4) Walmart Exclusives- See Pics!